Following his escape from slavery in Maryland to freedom in New York City in 1838, Frederick Douglass became a leader of the abolition movement and its best-known orator. His bookAutobiography of an American Slave became a best seller and exposed the horrors of slavery. 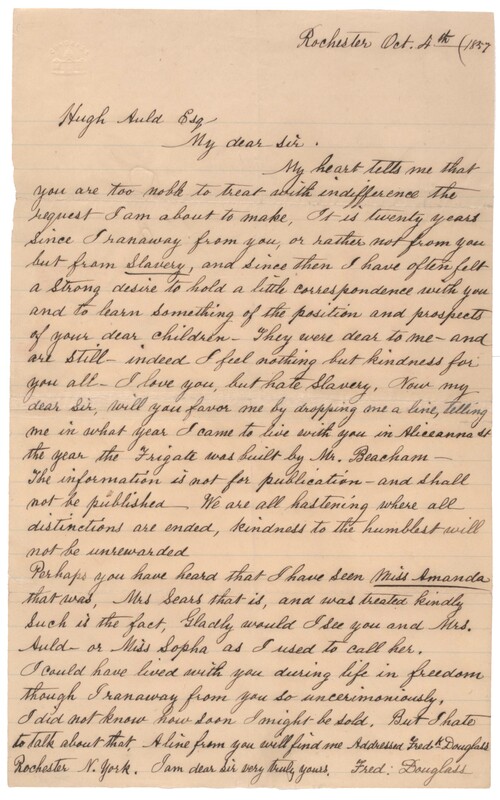 In this letter dated October 4, 1857, Douglass wrote to his former master expressing the desire to learn more about his own childhood and the children with whom he grew up. This letter also reflects Douglass’s capacity for forgiveness and is part of his lifelong quest, shared by all slaves, to establish his own history and know when his birthday was and who his parents and siblings were.